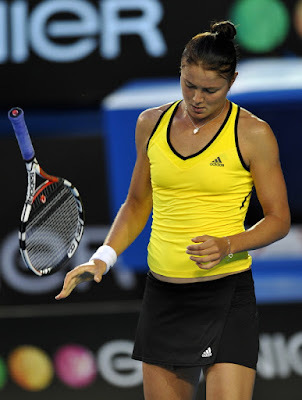 Unfortunately, I'm not the least bit surprised at the way things went for Russian Dinara Safina in the women's final of the Australian Open this morning. The new World No. 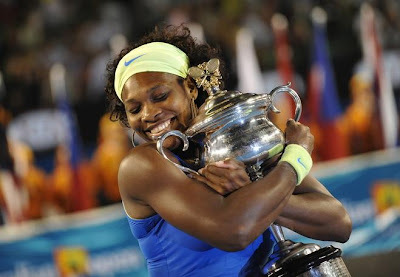 1, American Serena Williams, was going to bring far too much physical power and will power for Safina to mount any type of credible challenge for the title. Safina was pulverized 6-0, 6-3. 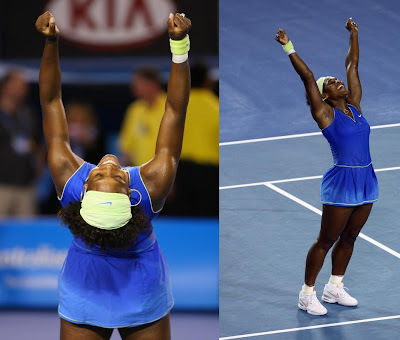 For Serena, this is her 10th grand slam title earned in her 10th year of playing the Australian Open. Along with sister Venus, the two had already earned the doubles title yesterday. For Safina, it was a sad sight to see. I just wanted to cry for that baby mid second set; she looked so defeated. She couldn't even muster a bravado for the crowd. Yet, it is these types of beat downs in life that generally raise your level...I hope that's what it does for her.